Anthony Lamberth presented the 2018 Ashlyn Taylor Lamberth Memorial Scholarship to Sydney Brown at Bradley High School’s Senior Awards Night held on May 14. The $1000 award recognizes Sydney’s academic achievement, school involvement and community service commitment. While at Bradley, Sydney has participated in FCA, Bachelorettes, Vocal Motion and Student Council. Additionally, she has volunteered with Ocoee Outreach and as a youth mentor at her church. Sydney will attend Lee University in the Fall where she plans to major in Nursing. 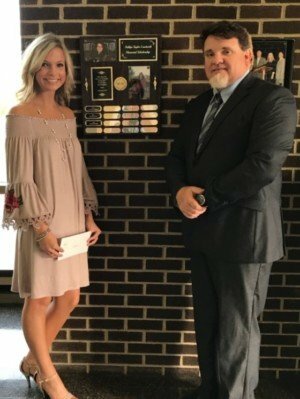 The Ashlyn Taylor Lamberth Memorial Scholarship was established in 2015 by Miss Carol’s Playschool and is supported by Ashlyn’s Family and friends. During her short time, Ashlyn brightened many lives with her care and concern for others. She was a 2015 honors graduate from Bradley High School and was very involved in the Bradley Central VocalMotion. She was a member of East Side Church of Christ where she was an active member of the youth group. She was employed with Miss Carol’s Play School and was to enter Lee University in the fall with a full academic scholarship.